Yoga rings improve muscle tone of the upper, inner and outer thighs, arms, lower body, upper body and core. Tones the arms, thighs and chest, Strengthens ones' posture and mobility effectively! Toning rings or Pilates Rings as some call them are becoming very popular in the fitness community due to their versatility, portable design and effectiveness. The ring strengthens and tones your body in only a few minutes each day while increasing the effectiveness of Pilates exercises. 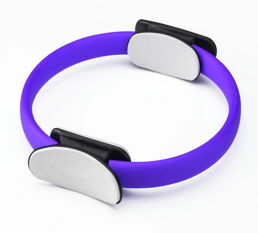 Worth adding it to your Pilates accessories! Target almost any area of the body, great to be one of you Pilates equipment. You can use a fitness ring to target almost any area of the body , making it one of the most perfect Pilates equipment you can own . Great Pilates Circle for Strength, Joint and Flexibility training at Home or at the Gym. Effectively improve your yoga and Pilates in Core workout, abdominal, thigh, leg and arm toning. Body wheels are common back stretching devices used during yoga and pilates work outs. Key factors are a high weight resistance, flex variations, product weight, wear resistance, non slip material, smooth edges and a comfortable touch. light green yoga / pilates rings pilates ring by a G.F.F. manufacturer pilates body wheels manufacturer sample "turquoise, black"